This chest on chest consists of a moulded cornice to the top with canted corners and dental moulding with a blind fret decoration below, this leads down to fluted canted corners to either side of the drawers. The drawer configuration consists of three small (the central drawer being slightly larger) over three long graduated drawers, all having finely figured solid mahogany drawer fronts with a moulded edge, oak linings and original fine quality brass handles and escutcheons. 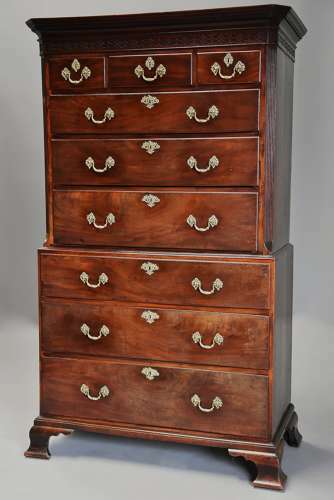 This leads down to the bottom section consisting of three long graduated drawers all having finely figured solid mahogany drawer fronts with a moulded edge, oak linings and original fine quality brass handles and escutcheons. The sides of the chest are mahogany with a pine back and the piece stands on four bold ogee feet. This chest on chest is in exceptional condition for age, is of stable construction and can go straight into a home.